ST. JOHN’S, NEWFOUNDLAND – A coalition of organizations including the Franz Weber Foundation, The Humane Society of the United States/Humane Society International and Respect for Animals, brought members of the international media and a Member of the European Parliament to observe the commercial seal hunt in the Front this week. In the face of violent mobs and blockades as well as unlawful denial of permits to observers by the Canadian government, independent journalists were able to film the commercial seal hunt in the Front for the first time in more than two decades. 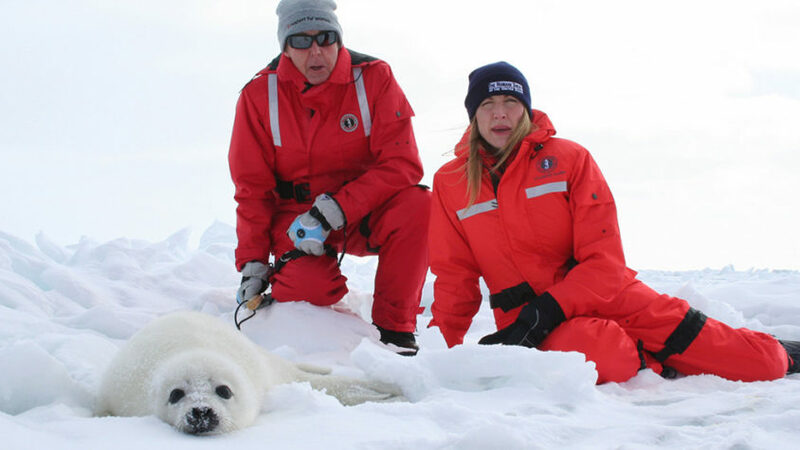 “The illegal and violent actions by seal hunt supporters this year have exposed the depths to which the sealing industry and Canadian government are prepared to sink to defend the indefensible,” stated Rebecca Aldworth, director of Canadian wildlife issues for The Humane Society of the United States. In Blanc Sablon, observers were held hostage by a crowd measuring in excess of 80 people. Vehicles attempting to depart for nearby helicopters were followed, and one was rammed by a local truck and forced off the road—endangering the lives of the journalists inside. The footage that was obtained of the seal hunt in the Front shows clear violations of the Marine Mammal Regulations that govern the hunt, including sealers shooting seals, then clubbing them, and finally stabbing them with hooks and dragging them across the ice – all without checking to ensure the animals are dead. Last year, when the first baby seal was killed on the ice, The Humane Society of the United States and a powerful network of animal protection groups representing tens of millions of people around the world declared a global boycott of Canadian seafood products. More than 400 seafood wholesalers, restaurants and grocery stores, and 280,000 individuals are taking part in the boycott, and values of Canadian seafood exports to the United States have already declined by ten times the value of the seal hunt.